As planned, the beta testing of CloudAhoy app version 2.0 had started on June 5th. There are over 20 testers right now, and most are rather active. The majority own an iPhone and an iPad, and run the app on both. I have received tons of good advice and problem reports. THANK YOU VERY MUCH, DEAR TESTERS ! ! ! At this point most of the planned features have been implemented. 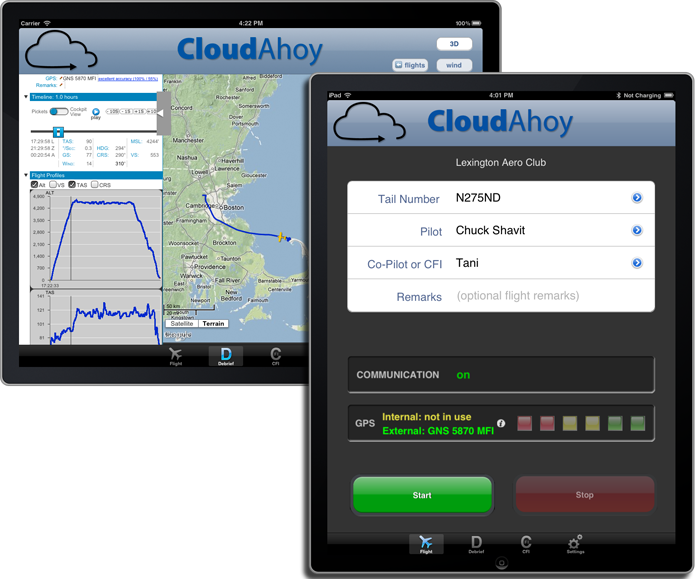 They include: a universal app with native iPad support; In-app debriefing (2D) of the recent flights, and a special CFI tab. The app is mostly done, but there are still some odds and ends that need addressing. I can almost hear you asking: hey, that’s great, but what about 3D briefing on the iPad? The answer: iPad-based 3D will be available as well. Initially more limited than what’s currently available on Windows or Macs, but hopefully the gap will be narrowed over time. I expect the CloudAhoy 2.0 app to be in Apple’s app store towards the end of this month or in early August. Again, many thanks for all the excellent feedback! Great stuff. Can’t wait for the new features. Thanks for your hard work. Been using it on every flight since i got it in the App Store.